(Jordan Strauss | Invision | The Associated Press) Dan Smyers, left, and Shay Mooney, of Dan + Shay, pose in the press room with the awards for song of the year and single of the year for "Tequila," and duo of the year at the 54th annual Academy of Country Music Awards at the MGM Grand Garden Arena on Sunday, April 7, 2019, in Las Vegas. 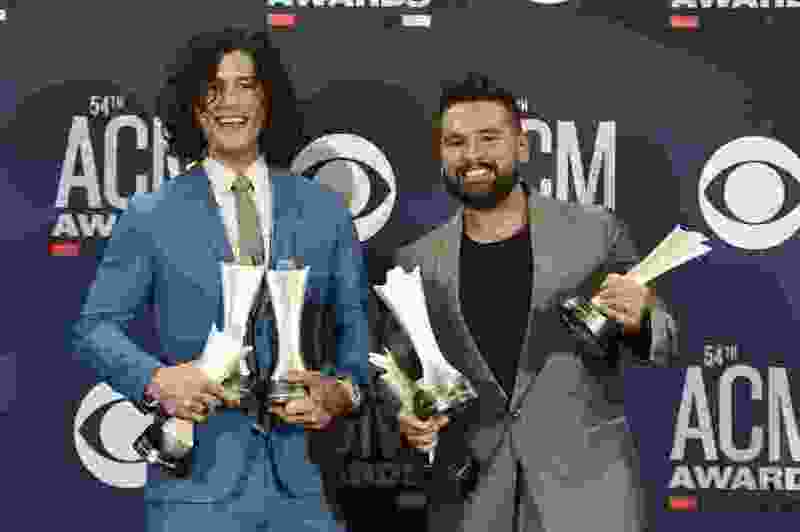 Country duo Dan + Shay continued their career-making year at the 2019 Academy of Country Music Awards on Sunday night, as they won three awards — the most of any act — and became the night’s running joke. "I'm gonna give this to Dan + Shay so they can go home with four," Thomas Rhett declared when he picked up the trophy for male artist of the year. Host Reba McEntire declared that the show should be renamed "Dan + Shay's Excellent Adventure." Even Dan Smyers and Shay Mooney themselves, clearly overwhelmed, were self-deprecating by the time they gave their third speech. "I think somebody got the cards mixed up," Smyers deadpanned as they accepted the award for vocal duo. They also walked away with song and single of the year for the ballad "Tequila," the smash that earned them their first Grammy for duo/group performance. Kacey Musgraves continued her winning streak with "Golden Hour," which propelled her to four Grammys in February, including album of the year. This time, she won for ACM album and female artist of the year; and though she curiously did not get a performance slot on the three-hour telecast, she made the most of her time on stage with an empowering message. "This award goes out to any woman, or girl — or anybody, really — that is maybe being told that her perspective or her style is too different to work," said Musgraves, perhaps in a nod to the fact that some country music gatekeepers don't appreciate her unique perspective. "Just stay at it. It'll work out." Meanwhile, Keith Urban triumphed in the coveted entertainer of the year category, and became emotional as he thanked his wife, Nicole Kidman (beaming in the audience, as usual), and their two daughters. A complete list of winners is below; here are some of the best and worst moments from the show. McBryde, who barely scraped out a living for a decade in Nashville before she released her critically-acclaimed debut album last year, had one of those moments that artists only dream about: She got to go on national television and sing a song about people who thought she would never make it. Specifically, the stunning acoustic ballad "Girl Goin' Nowhere," inspired by a teacher who told her she would never be a country singer. At the end of the performance, McBryde (who won new female artist of the year) was so choked up she could barely sing. "Wow," she said, as the audience gave her a thunderous standing ovation. • The Maren Morris and Brothers Osborne collaboration. Some ACM performances were deeply solemn, while others radiated pure infectious energy — Morris and TJ and John Osborne were definitely the latter. The three singers (who are close friends in real life) had a blast with their joyful new song "All My Favorite People," a cut off of Morris's new album, "Girl." The performance had some Nashville inside jokes, including a sign for Santa's Pub, one of Music City's favorite dive bars with epic karaoke. • The many other duets. Typically, country award show duets are hit or miss, but this year had a surprising number of solid pairings. Kane Brown and Khalid impressed with a remixed version of "Saturday Nights," which Khalid re-released in January. Dierks Bentley and Brandi Carlile brought down the house with "Travelin' Light," which appears on Bentley's album. Eric Church and McBryde's blended perfectly together on his song "The Snake," about the current poisonous political atmosphere. And as an added bonus — there was some 1990s and early 2000s country! George Strait and Miranda Lambert were a hit with Strait's "Run," while Luke Combs belted out an updated rendition of "Brand New Man" with Brooks & Dunn. • Blake Shelton’s unexpectedly dark sound. Shelton has been coasting for awhile with radio singles that all sound vaguely the same. However, his new "God's Country" has an unexpected gothic energy that one wouldn't necessarily associate with the "Voice" coach. Yet it seems to be working. His performance, with spooky dark thunder clouds behind him, helped skyrocket the track to No. 2 on iTunes. • Carrie Underwood’s pool party track. Speaking of singers trying new things, you don't usually think "party song" and "Carrie Underwood." Usually, her singles revolve around "love" or "vengeance" or "murder." So props to her for going in the complete opposite direction with "Southbound," a upbeat, spring break-themed track that started at a Vegas pool (joined by her tour openers, Maddie & Tae and Runaway June) and continued into the ACMs venue, with lots of backup dancers who looked thrilled to be there. The country quartet is famous for their ballads and harmonies, and their new single has the ability to stop you in your tracks when you hear the brutally honest lyrics, about all the expectations put on women: "Pose like a trophy on a shelf / Dream for everyone but not yourself. . .I've heard of God the son and God the father / I'm still looking for a God for the daughters." • The lack of female nominees and winners. Although the ACMs gushed about how Lambert has the most ACM awards in the history of the show (32! ), Aldean was the one who got a special tribute and speech on the telecast as he was named artist of the decade. Granted, Aldean is a huge star — but it looked a bit odd when they both performed medleys of their big hits, and then only Aldean got the honor.